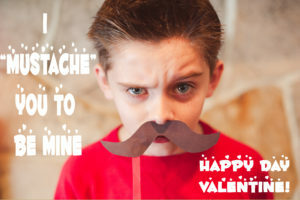 Young kids LOVE Valentine's Day! They LOVE giving their friends and teachers cards and candy! They LOVE their classroom party! As a busy mom it's super easy to buy a box of cards from the store and call it good. But it's just so...boring. Those cards seriously just hold the candy and will find their way to the trash can by the end of the day. Why not make some super cute cards for your kiddos to exchange - cards that are truly unique? 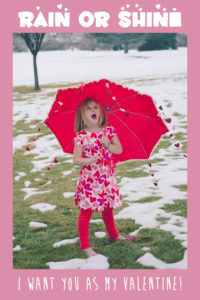 I am going to share four super simple personalized Valentine card ideas that your kids' friends and teachers will LOVE! 1. Cut out some pink and red hearts from construction paper and tie them to strings. Then tie the strings of hearts to an umbrella. Add as many hearts as you'd like! Take a photo with your kid holding the umbrella. 2. Buy a pair of inexpensive heart shaped sunglasses and have your child be a sassy model wearing them! 3. Buy inexpensive paper hearts that look like a doilies. Then write each friends or teachers name on a heart. This Valentine takes a little more time to prepare since they are even more personalized for each individual. 4. Make a mustache out of brown or black construction paper and take it to a popsicle stick or straw. Your child can hold the mustache up to their face as if they are in a photo booth. With each of the above ideas you can use a free photo editing software, such as BeFunky, to add text, frames, graphics, etc to your personalized Valentine cards. 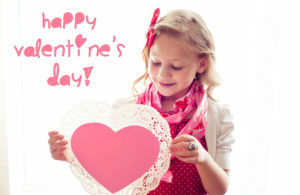 I'd love you to share any ideas you've tried for creating personalized Valentine Day cards!